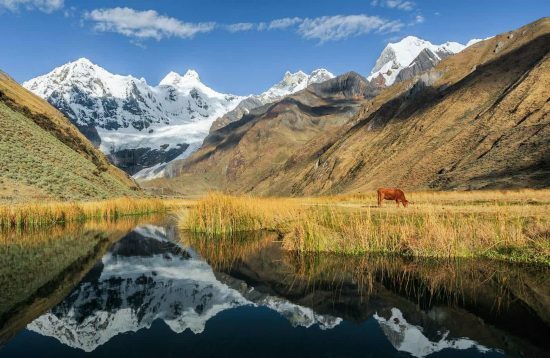 Join us on the Huayhuash Challenging Trek to fully appreciate the sheer scale and beauty of the snow-capped summits of the Cordillera Huayhuash, including Yerupaja, the second highest mountain in Peru. In this route we also include a side trip to the base of Siula Grande, location of the famous mountaineering story as told in the book by Joe Simpson “Touching the Void”. 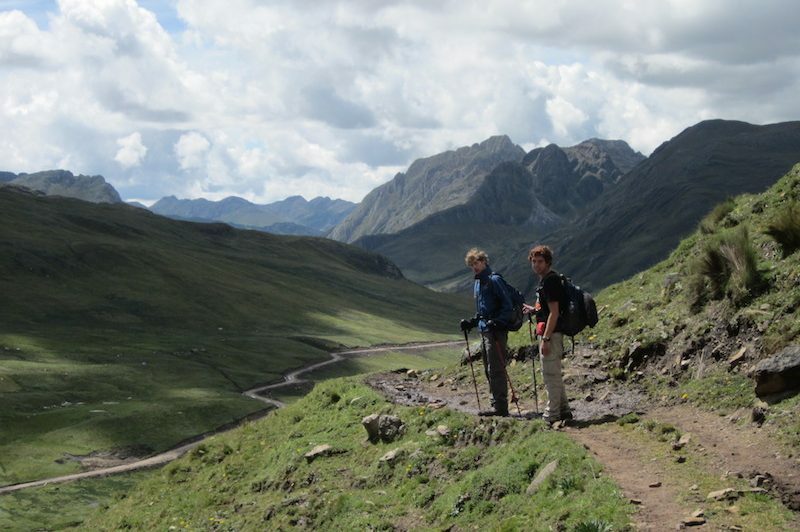 For the lover of high mountain regions, it would be hard to beat this exceptional trek. 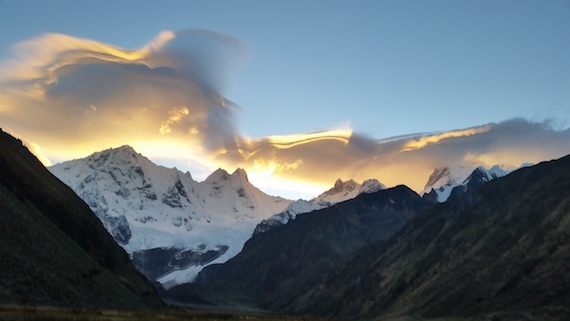 All about the Huayhuash Challenging Trek. The big circuit of the Cordillera Huayhuash lasts 10 days, almost always moves at altitudes over 4000m and overcomes at 170 km distance 8 passes between 4300 and 5000m. Our trekking adventure in the Cordillera Huayhuash begins. 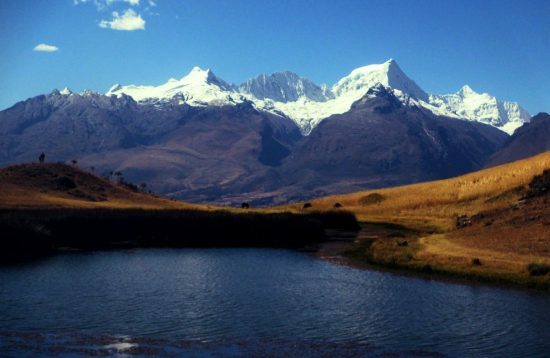 You are picked up from your hotel and we head south of Huaraz crossing the villages of Chiquian and Llamac. During our drive we pass traditional Andean towns with typical Quechua homes and rich farm land. After 6.5 hours of driving we arrive to our first campsite Matacancha (4150m). Before dinner you have some time to explore the area around the campsite and get ready for the next day. 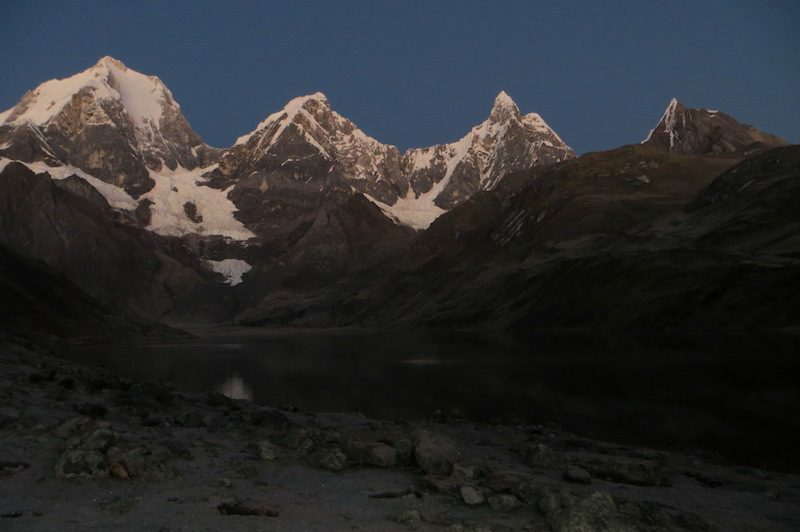 Today we start hiking early and we reach Cacananpunta pass (4700m) after 2.5 hours. We hike back down to 4500m always enjoying views over Jirishanca (6126m) and Rondoy (5883m). 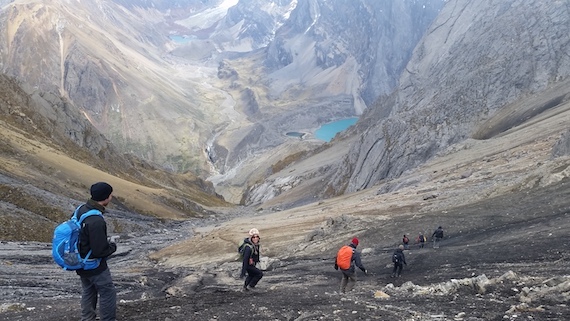 Then we hike 2.5 hours up to Carhuac pass (4650m) from where we have good views of the beautifully stunning peaks of Yerupaja, Siula Grande and Jirishanca. From this vantage point, we descend to our next campsite at Carhuacocha Lake (4100m). On this campsite we have mountains all around us: Yerupaja Grande (6634m), Yerupaja Chico (6515m), Siula (6356m), Jirishanca (6126m). 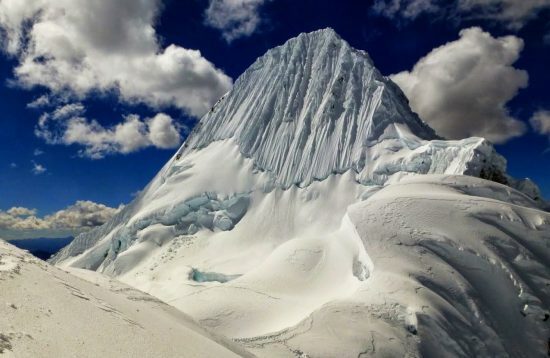 Today we cross the highest pass of the tour, the 5020 m high Punta Cuyoc. 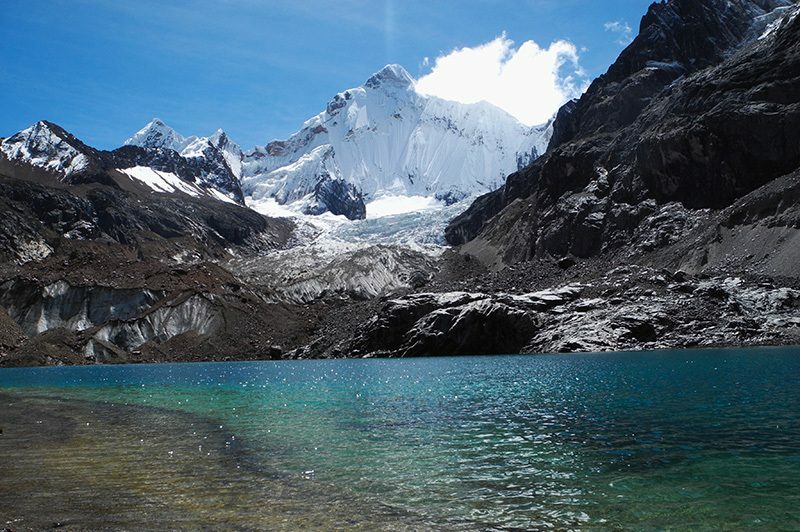 The view is terrific – east to the Cordillera Raura with the huge plateau glacier, to the Nevados Puscanturpa just above the pass and – now from the south – to the highest peaks of the Cordillera Huayhuash, Sarapo, Siula and Yerupajá. 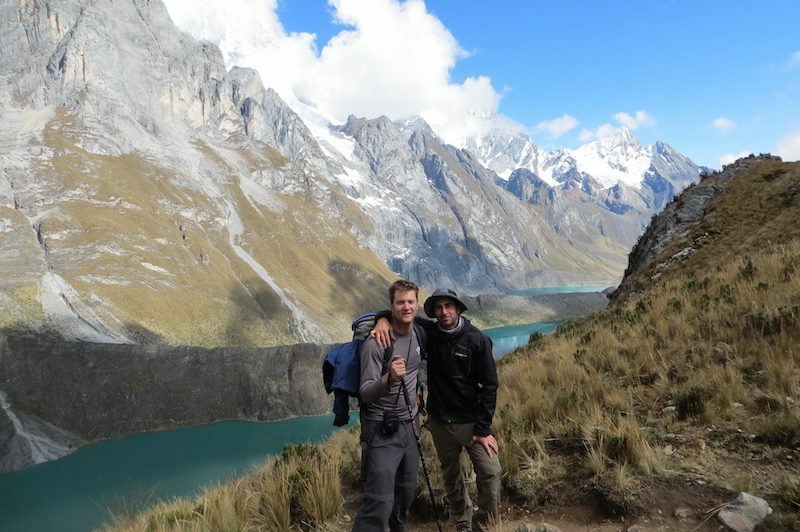 After a short break, we hike the partly steep trail down to the campsite of Pampacuyoc (4500m). We are going up to San Antonio pass for about 2 hours. A steep and long ascent in difficult terrain. Arriving at the viewpoint of the San Antonio pass (5000m) you see the whole Huayhuash range all around. After enjoying the beautiful views we start descending the most difficult downhill part of the trek for around 3 hours. We reach the next camp Cutatambo (4300m). After breakfast we start walking straight up to the viewpoint of the famous movie scene “Touching the Void”. We see where Joe Simpson tried to climb Siula Grande mountain. Then we return back to Cutatambo camp and relax for the rest of the day. We pass by an impressive waterfall this morning before hiking down the Calinca Valley to the village of Huayllapa (3’700m). Then we hike up 4 hours to reach our next campsite Huatiac (4’290m) with beautiful views of the mountains around us. A long day with two challenging passes. First a rocky trail to Punta Tapush (4800 m). Again magnificent views, even on the slightly recessed Nevado Diablo Mudo (5’223m). 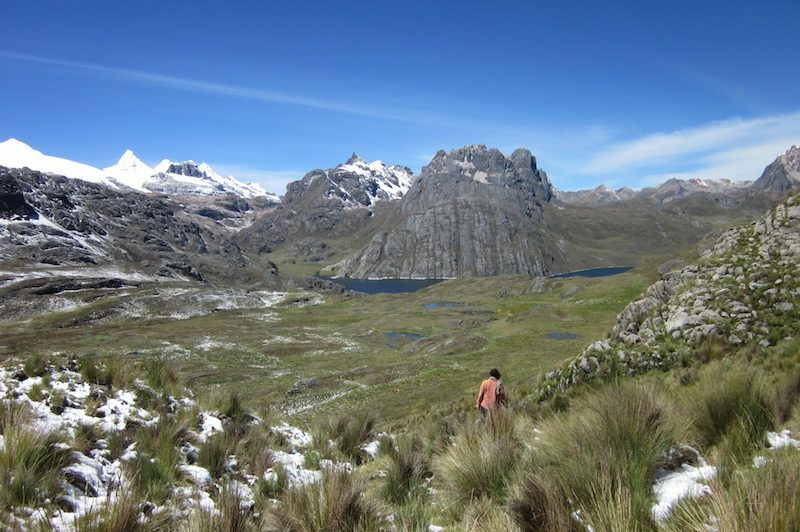 We descend via the Gaspapampa Valley and Susucocha Lake (4’470m) with its diverse bird species. 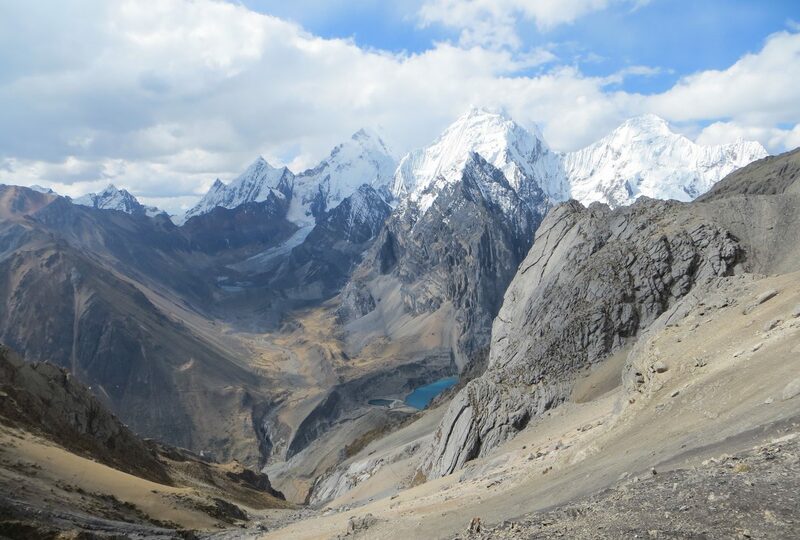 The final and partly steep and difficult ascent for the day is to Yaucha Pass at 4’850m. Finally descending to Jahuacocha lake (4150m). We camp next to the lake and enjoy the majestic mountains surrounding us. Our final day in the Huayhuash and we leave the campsite trekking east via the Jahuacocha Valley trail that continues along a water pipeline. Then it is a long descent back to the Llamac valley and the village of Llamac. From there we drive back to Huaraz. 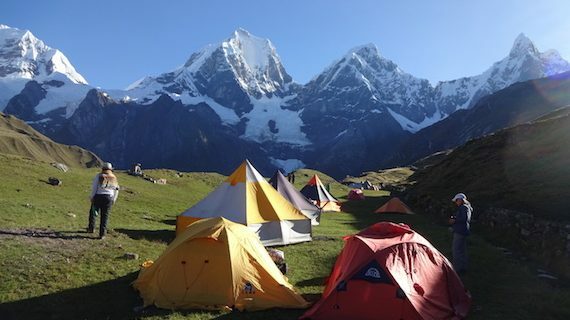 During the Huayhuash Challenging Trek, you spend the night in two-person tents. The selection of camp sites depends on the reachable water points and takes into account – as far as possible – scenic spots. 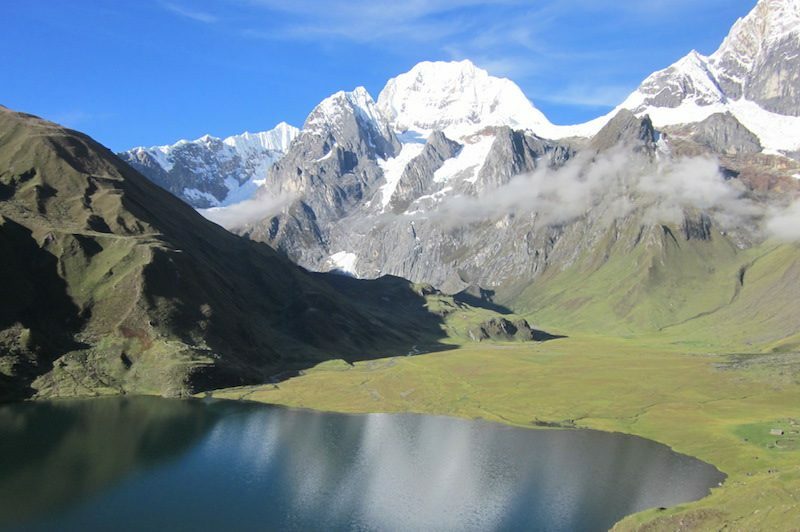 In the Cordillera Huayhuash there are countless dream camps on highland lakes at the feet of snow-capped peaks. Donkeys carry your luggage during the trek, you only carry your daypack. 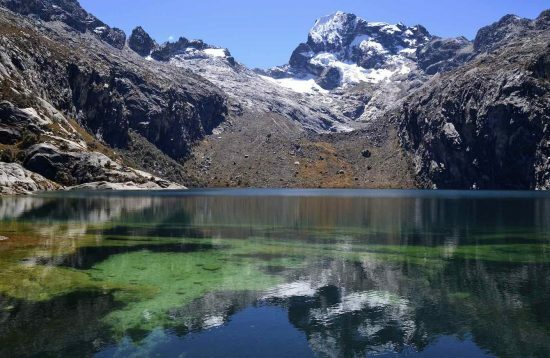 How do I prevent altitude sickness?Are there any toilet facilities during the Huayhuash trek?Are there any showers at the campsites? Are there any toilet facilities during the Huayhuash trek? Are there any showers at the campsites? Yes, there are very basic toilet facilities at the campsites of the trek. No, there are no showers at campsites. The only option is at the Viconga hot springs where you can swim and relax.